When they set out to create Meridian Hill Pictures (MHP) in 2010, brothers Lance and Brandon Kramer did not envision a big, Hollywood-style production company. As documentarians, they wanted to make films about real people and real issues. They were especially interested in giving voice to untold stories in their native Washington, D.C.
From their studio in Washington's Columbia Heights neighborhood -- an area known for its ethnic and cultural diversity -- Lance and Brandon have produced films on a variety of local subjects. The idea for their latest film, Green Corps, was inspired by an organization headquartered in the same building as MHP. Shortly after the formation of Meridian Hill Pictures in August 2010, Lance and Brandon moved into their studio in the historic Josephine Butler mansion. Now a community center, the home was constructed in the 19th century as the potential residence of the vice president. The mansion's largest tenant over the past years has been Washington Parks and People (WPP), an organization dedicated to sustaining and growing D.C.'s green spaces. In the fall of 2010, WPP Executive Director Steve Coleman invited Lance and Brandon to observe the construction of the North Columbia Heights Green; a Parks and People project that involved transforming an empty lot into a garden. Lance and Brandon filmed the garden's construction and used the footage to produce the successful short film Community Harvest, but the brothers felt there was another story in the garden's creation that the film didn't address. "We realized that the themes and ideas that we explored in this film were resonating with people in ways we didn't even fully understand, but we knew something powerful was happening," said Lance. "Though Community Harvest sort of focused on the space, we realized that we were missing a part of the story which was much more important - the growth, and to some extent transformation, of the people who had the experience of working in this space. Compared to the change of the land, the change of the people is more complicated and interesting and profound." 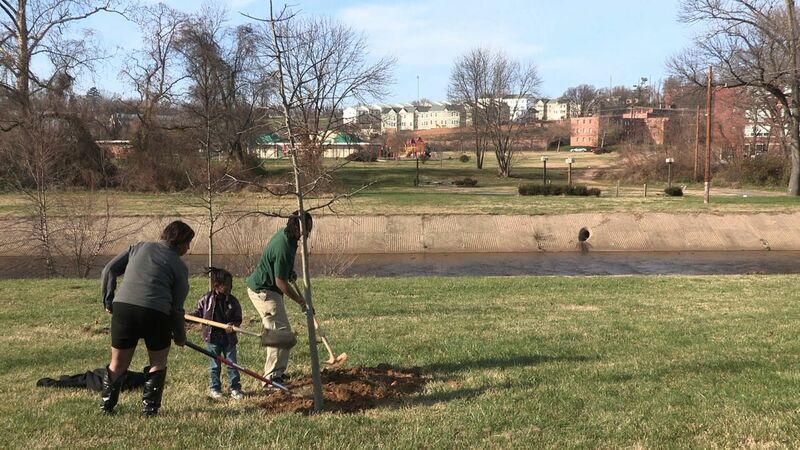 Much of the work done on the North Columbia Heights Green was completed by members of DC Green Corps; an urban forestry job corps, operated by Washington Parks and People, that was originally funded with money from the 2009 American Recovery and Reinvestment Act (ARRA). Descended from the Civilian Conservation Corps of the New Deal Era, Corps are comprehensive personal development programs that engage participants in community service that improves their neighborhoods and the environment. Through service projects, Corpsmembers gain job skills, leadership skills, confidence in their abilities, and pride in their communities. Most DC Green Corps members who worked on the North Columbia Heights Green had no previous experience with landscaping or park management, but this didn't matter; the Corps was created specifically for unemployed District residents who simply needed the work. With ARRA funding, the Corps offered participants a steady income, structure, and job training that could pay off in the future. DC Green Corps continues to operate even though the ARRA funding expired, but Corpsmembers now only work for 10 hours a week and receive a stipend instead of an hourly wage. One thing that hasn't changed, however, is the length of the program; Corpsmembers receive 12 weeks of training and then must move on. A majority of Green Corps members are adults outside the age range traditionally served by Corps (member organizations of The Corps Network - the national membership organization of service and conservation corps - generally serve young people ages 16 - 25), but the program still provides the same training and assistance one would expect from a Corps. Members work in crews to plant trees, maintain gardens, clear waterways, and carry out other greening efforts throughout Washington. Many Corpsmembers struggled to find work before they heard about the Corps, but they all seemed to find hope in helping beautify and improve their city by working alongside other D.C. residents who were experiencing similar hardships. Lance and Brandon saw in these Green Corps members, and in the Corps itself, a powerful, D.C.-based story. Lance and Brandon are fourth generation Washingtonians. Both brothers have always felt a strong connection to their family roots and to the city. They've also always had a strong affinity for film. When they were kids, they liked to play "video rental shop," and they often borrowed the family camcorder to make spoofs of their favorite movies. Before founding MHP, Lance and Brandon were pursuing separate careers in different parts of the country, but the death of their grandparents brought them back home and helped them realize that they wanted to (and could) work together. Documentary filmmaking was a perfect intersection of their respective backgrounds in film, education, and journalism. "I think this partially comes from having worked as a journalist, but I'm really drawn to telling stories that are not currently being told, and from perspectives that aren't well represented in the media," said Lance. "I've been frustrated by, inspired by, and sort of drawn to helping address issues of fair and equal representation in the media...I've just been really interested as a filmmaker, and maybe to a certain extent as a community activist, in how we can help broaden that access to the media. In particular, provide resources to people who could tell their stories if they only had access to the right resources." In the end, Green Corps will provide a snapshot of what it means to be part of an effort to improve one's city. It will also show what it's like to try and survive in a tough economic climate, to take a temporary position in a job corps with the understanding that the work might be fulfilling, but it won't last forever. To best tell the story of DC Green Corps and its members, Meridian Hill Pictures decided to create a film that was not made exclusively of their own footage. In addition to filming the Corpsmembers at work and in their personal lives, the film crew also gave their subjects flip cams so they could document their own experiences in the Corps. "I think when the film is finished it will have this kind of truthful perspective of seeing the world through the eyes of the Green Corps members, not just through our own eyes," said Lance. "Because the Corpsmembers were trained in how to use the cameras, they were doing their own additional self-documentation. There are video walking tours of their neighborhoods, there are interviews with community members, there are video diaries that they've done at home absent us being there. There's this treasure trove of material that we're just now starting to edit and figure out how to piece it all together." When MHP started filming Green Corps, they didn't have a solid direction or vision. They wanted to tell the story of the Corps, they wanted to give a voice to the Corpsmembers, and they wanted to document history through capturing how the Great Recession affected one small group of people. Lance has always loved history and recognized a connection between DC Green Corps and FDR's efforts to get people back to work during the New Deal Era with the Civilian Conservation Corps (CCC), a job initiative that employed over six million young men between 1933 and 1942. "Thankfully, a lot of what we know about the New Deal time period we owe to wonderful photographers, documentarians, writers, journalists..." said Lance. "I've always been really intrigued by that, and finding myself as a filmmaker in our most recent recession, I thought there could be a real role to play in drawing inspiration from what happened during [the Great Depression].... It felt like the storytelling that's come out of the experiences of people impacted by the Recovery Act has not been as profound as it could be." 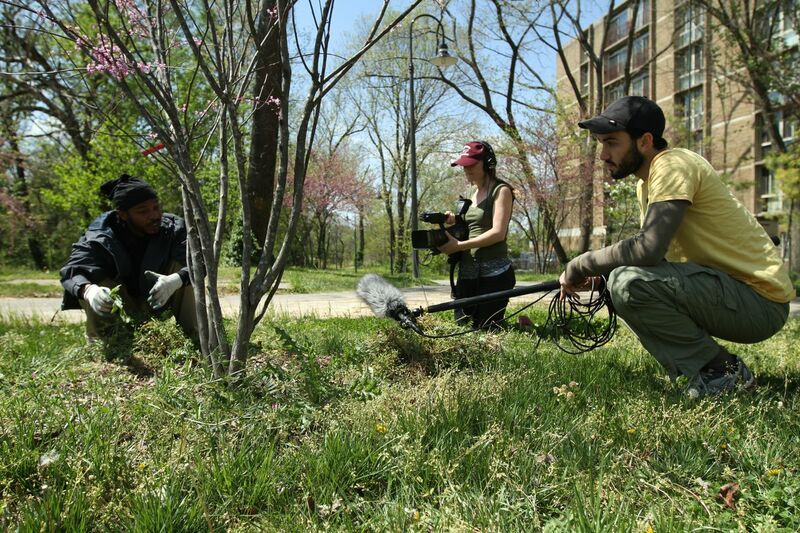 When DC Green Corps was getting started and MHP was just beginning to film the Corps' activities, one of the Meridian Hill Pictures interns did some research and made the connection between Green Corps and the larger conservation corps movement. There are currently 127 corps programs affiliated with The Corps Network, collectively enrolling 27,000 Corpsmembers from across the country each year. MHP's Research also uncovered how a number of former CCC boys, now all in their 80s and 90s, were still very active in a Maryland CCC Legacy club. Lance and Brandon were intrigued to learn that these former Corpsmembers still got together every month, united by the conservation and resource development projects they completed more than half a century earlier. "While there's not a direct connection or an overlap between the CCC guys and the DC Green Corps members, we thought that in trying to understand the long term impact of what Corps efforts today will be, it might be helpful from a narrative perspective to film these older guys and look at how decades after their short term experience in the CCC, they were left with some sort of lasting impact." 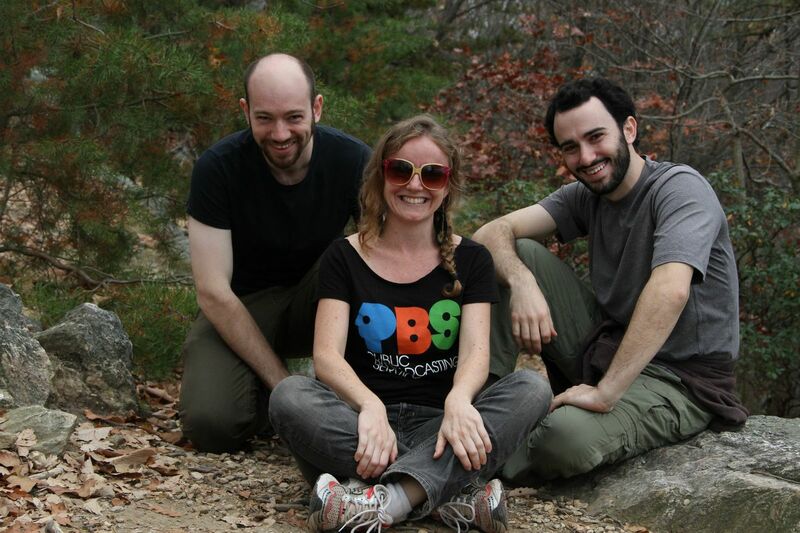 The completed film, which is tentatively scheduled to be ready for viewing by the end of 2013, will include footage of the Green Corps members at work on urban forestry projects throughout D.C.; footage shot by Corpsmembers as they navigate their personal struggles and the Corps experience; and footage of the CCC boys reminiscing on their Great Depression-era Corps experiences, when they made $1 a day for their conservation work. Though almost all of the D.C. Green Corps members featured in the film completed their service by the spring of 2012, the MHP staff continued to film, capturing Corpsmembers looking for new jobs and readjusting to life without the structure of the Corps. MHP is just beginning to edit Green Corps, but Lance suspects the movie might end with footage shot around the 2012 presidential election. These clips document how former Corpsmembers felt about their personal situations and the national climate at this time, several months after their service ended. Meridian Hill Pictures hopes Green Corps will act as an entry point into understanding the experiences of the individual Corpsmembers, the effects of the Corps on people and communities, and the experience of the Recovery in general. They also have specific hopes for how former Green Corps members will receive the film. "I'm hoping that they'll be proud. I hope they feel we honestly depicted their experience. I hope they feel like what they see is aligned with what they felt when they went through the program," said Lance. "I hope that in some fashion the existence of this film will be beneficial to Corpsmembers not just as a reflective tool, but for where they want to go in their lives. I think most people are really proud of the work that they did while they were a part of the Corps. I think many, if not most, of the people who went through the program still consider themselves a part of the Green Corps even though they got their certificates of completion. Maybe the film can help demonstrate what the Corpsmembers experienced...I guess connecting back to the CCC guys, this can be a long term document to communicate what happened here some 50 years down the line." Lance and Brandon have tried to maintain contact with as many Green Corps members as possible, but the reality is that a good portion of the Corpsmembers "live on the fringe," as Lance said. Some of them don't have cell phones, and many of those that do have pay-as-you-go phones that they fund when they can. MHP plans to make a concerted effort to reconnect with everyone once the film is ready for public viewing. As for the Corpsmembers that MHP has managed to stay in contact with, Lance says there are definitely a few success stories. Some former Corpsmembers continue to work for Washington Parks and People or found jobs in the neighborhood. "One really wonderful example is this guy Michael who became sort of a main character in the film," said Lance. "He was in prison before and he's now working in a housing complex as a super. One of the aspects of his job is that he has the keys to every apartment in this complex. He's watching over the building and taking care of tenants. For him, simply knowing that he has the keys and that his employer trusted him even though he has a record, that's pretty powerful. When he was in the Corps, did he plant trees? Yes. Does he have a redefined appreciation for nature and the land? Absolutely. But along with that there are these bigger issues of rebuilding confidence and self-respect and trust." Looking back at the many hours of footage that were shot for Green Corps, what stands out to Lance is a particular series of scenes that Brandon suggested shooting. 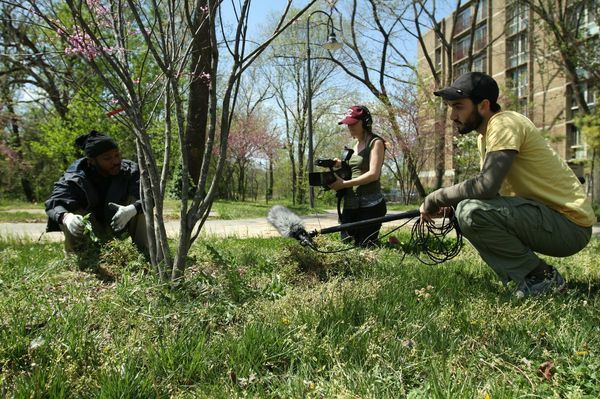 The film crew asked several CCC boys and members of the DC Green Corps to each talk to a tree they (or their peers) planted during their term of service. "These dialogues were one hundred percent unscripted...We just posed the question and right off the cuff, the poetry that spilled out of the members of the Green Corps and from the CCC guys - people who you wouldn't think of as poets - it's really beautiful. There's this deep meaning and deep connection that they clearly formed with those specific trees and trees in general. I think the film will get at that even if it's hard to understand what these guys are feeling. I hope the film complicates in all the best ways what you might think of when you see someone planting a tree...You can understand how challenging it might have been for that person to get to that point of planting the tree and what it means in that moment for that person and for that community." Green Corps is tentatively scheduled for completion and initial release by the end of 2013. Through using new technologies, Meridian Hill Pictures hopes to make the film as accessible as possible. A prototype of Green Corps can be seen here.